One of the dangers of knowing artists (pity me!) is that, when they’re in town, they usually have pieces for sale. That is what happened a few weeks ago when Mitch and Diana Adams were in Vancouver a few weeks ago for the Chinese New Year celebrations. After dim sum, Mitch took my back to his mother-in-law’s apartment to show me what he had brought with him – and, inevitably I bought two: A Gagiid mask and a Killer Whale Comb. 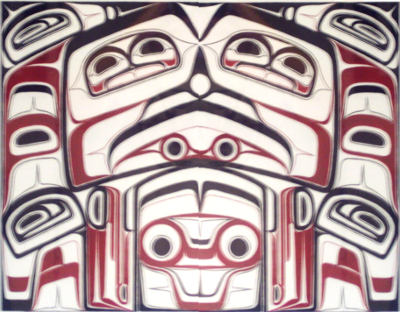 The Gagiid features in the dances of Haida secret societies. The Gagiid is a castaway who, as he wanders the shoreline by himself, grows so crazed that in his endless foraging he devours sea urchins without removing the quills, which embed themselves around his mouth. Cryptozoologists often take the story as evidence for the existence of the Sasquatch, but this identification requires a giant leap of illogic, since the Gagiid is originally a normal man, and in the dances (if what I have heard is correct), the point is to reintegrate him into society. Today, at least, the Gagiid is frequently green, a depiction that often encourages Incredible Hulk jokes – a comparison that is actually closer than you might at first think, since the story of the Hulk is also about reintegrating him into society. Mitch Adam’s Gagiid caught my attention because of the attention to details. 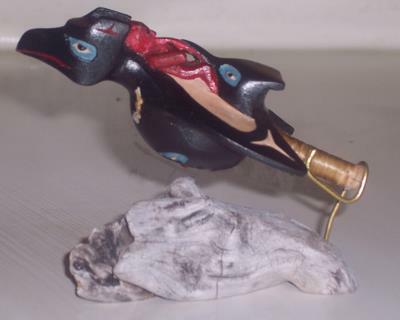 His mask’s blue eyes are not an anomaly, and most likely not an effort to connect the Gagiid with Europeans; blue-eyed Haida were apparently noted by the first Europeans to reach Haida Gwaii in the eighteenth century. However, like a shaman, this Gagiid has eyes with pupils that roll upward, suggesting he is in an altered state of consciousness. Other details follow naturally from the story. The Gagiid’s face is long and thin, as though he is half-starved. The gaps between his teeth suggest that some are missing, while those that remain are irregularly shaped and sized, as though they have been chipped, either through eating hard food or perhaps after too many falls on the rocks that line the shore. Moreover, not only are the lips swollen, but the the lower face is out of proportion, as though it has swelled, too. 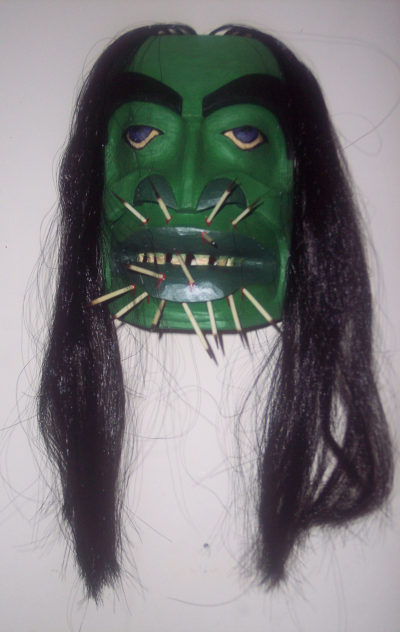 Similarly, the blood drawn by the sea-urchin quills (on the mask depicted as porcupine quills) is fresh and running on some, as though the wounds were fresh, and simply a ring of red on others, as though the wounds were made some time ago and the blood has dried. What makes this detailing all the more impressive is the size of the mask: approximately sixteen by ten centimeters. I have seen masks twice or three times the size with less attention to detail (several with woolly eyebrows that give the Gagiid the appearance of Groucho Marx, an effect that Adams has avoided, I’m glad to say). The same attention to detail is found in Adam’s Killer Whale comb, which is about the same height as the mask. Combs of this design, he tells me, were not for tidying a head of hair, as most people assume, but for untangling the warp of wool on a loom. 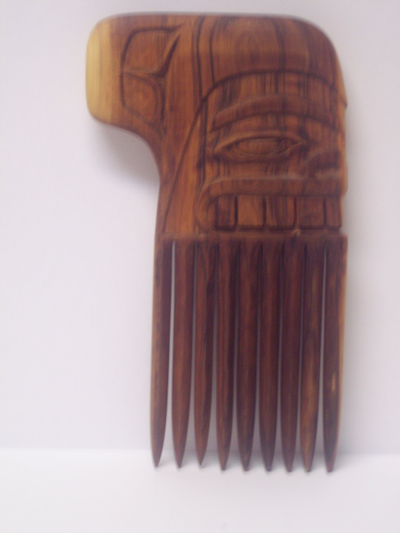 Perhaps this knowledge of the shape’s purpose encouraged him – unlike the designers of many combs in Northwest art – to carve a comb that is actually functional, with flat sizes and tapering ends, and not just an approximation of the shape. Made of yew, Adam’s comb benefits from the beauty of the tight and highly visible grain. However, the grain probably caused him trouble, too, since it runs vertically while the design is horizontal. On one side, the pupil of the eye looks as though it might been a knot, and, if you look closely, you can see several other places, such as the outer curves of the mouth or the shape of the nostrils, in which the two sides are not perfect mirror images. At any rate, even were identical sides possible, differences would remain, because the grain is much darker on one side than the other. 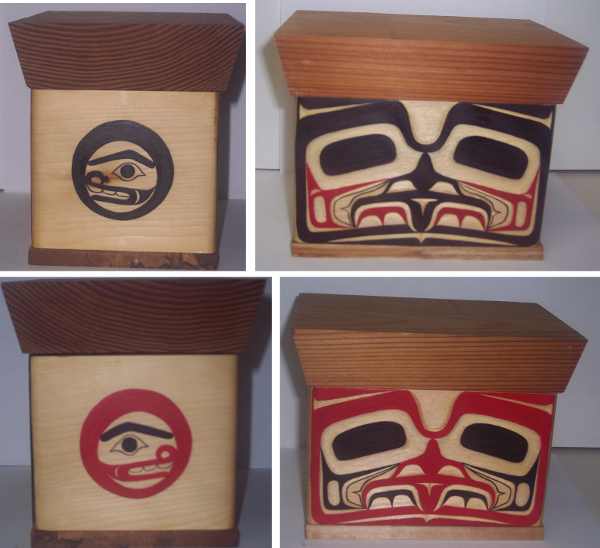 Ironically, the most regular part of the carving is the front design – probably the part least likely to be observed. Yet it is an indication of Adam’s determination and skill that the irregularities are minimized and unnoticeable to the casual eye. Having set himself a difficult task, he proves his skill by doing it extremely well. Notice, too, how the design conforms to the shape of the comb. 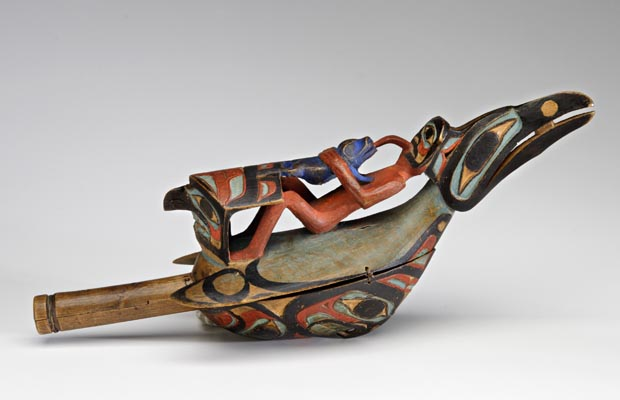 Only one design feature positively identifies the carving as a killer whale – the fin depicted on both sides of the handle. Like “Peaceful Warrior,” the laminate mask I bought several months ago, these two pieces show Adams’ ability to work in miniature. He is perfectly capable of a stunning work at larger sizes, as his “Blue Moon Mask” demonstrates, but Adam’s attention to detail makes his smaller works consistently stand out from similarly-sized pieces from other artists. My only reservation about buying these pieces is that, when I did, Adams lost the opportunity to show these work to the galleries while he was in town, and extend his reputation. I am sure that both would have sold. But, despite the danger of visiting an artist, I feel privileged to have had first chance at them, and to display them in my townhouse.